Bring a large pot of water with 1 teaspoon regular salt to a boil. 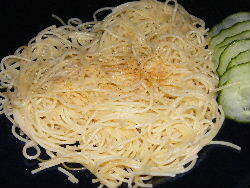 When it's boiling, add your pasta and cook--approximately 5-7 minutes for angel hair pasta, longer for heavier pasta. In a frying pan, melt butter. Drain the pasta and add to your frying pan. Sprinkle your seasonings on the noodles and mix in the frying pan on a high heat. If I'm making them for my daughter, I only warm them through and make sure that they are coated in butter and seasoning salt, but if I make them for myself or others, I like them a little more cooked, so I keep them on the high heat, stirring them for about 10-15 minutes. Click here for more great pasta recipes like Buttered Noodles!